This is your home page. Here you will find your profile, all the data that you may allow other members to see and become alerted to, most importantly: the itinerary for your next trip. Once the fields in “my next trip” have been populated, certain people on “SinglesFly.com” will be alerted to the fact that you and they share a similar itinerary. The user decides who gets alerted when they fill in their initial profile. When a user clicks this link they can view who requested contact with them. clicking this link takes a user to a page showing other members who share similar itinerary. Which means their home base is 50 miles or less from the user’s AND their business-trip destination is 50 miles or less from the user’s destination, at the same time, and they may be sharing the same free time. Clicking this link takes the user to a page where they can set up a “chat date” with members who will be departing from the same airport at the same time as the user. 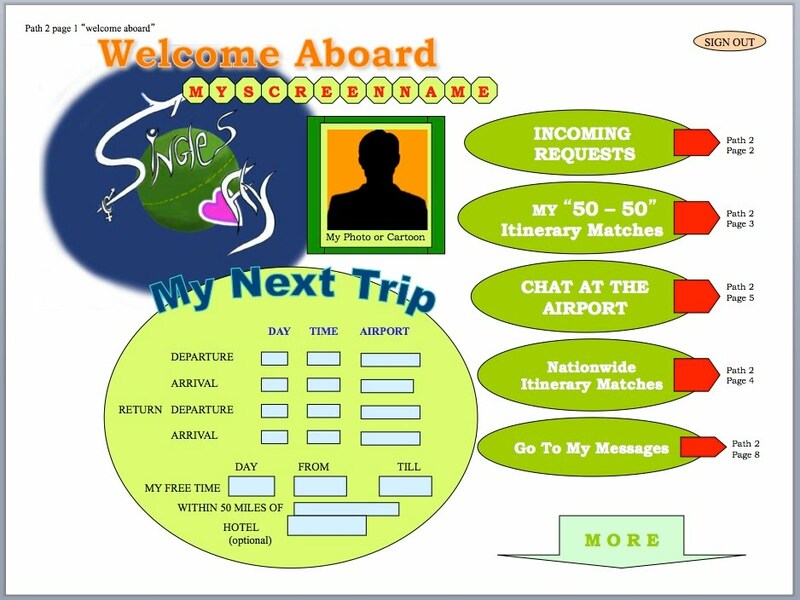 Such “chat date” is possible when the user receives an alert from “SinglesFly.com” on their mobile device, that another (50-50) user is at the same airport, waiting for their flight, taking advantage of that “down time” to chat, in anticipation of a possible date at the destination. clicking this link takes a user to a page showing members, nationwide who will be sharing similar itinerary as the user, which means they may be traveling to a destination, 50 miles or less from the user’s destination, at the same time (not necessarily same arrival and departure dates) and may share the same free time. clicking this link takes the user to their inbox, outbox page where user may find messages from members with which a contact has already been established on the part of both. a “50-50” member posting an itinerary similar to the one posted by the user. “members I contacted within 50 miles” - link to a page showing history of contacts with members who’s “home base” is within 50 miles of the user. A user may want to access this list to find out the status of members who he/she can date on the road OR near where they live. 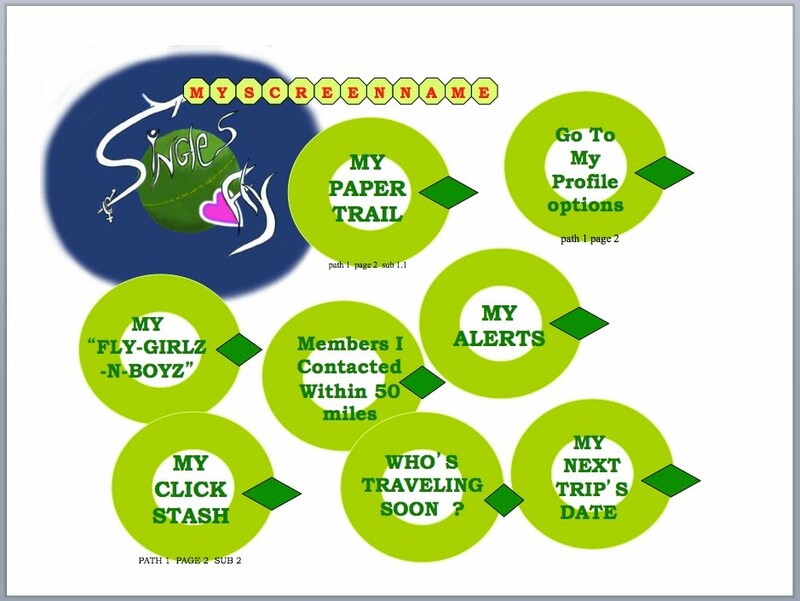 “My Fly Girlz N Boyz” - this is a group of members who agreed to form a circle of travelers who would like to be able to receive alerts regarding the current and future travel of all the other members of this circle / group. Memebrs in this group may see each other’s ENTIRE profile and all activity with other members. The members in this group allow each other complete access to all correspondence, all “paper trail” , all past and future itineraries and details or testimonials of all members’ past dates. Date testimonials can be posted by members in a page, on their profile called: “Date Dirt” (page24). This is a page, in a member’s profile where a member may chronicle their dates, as they happen or after the fact, see more below. by using this link a member can check how many “clicks” , are in their “click stash” , ready to be used by other members to contact that member, or by him/ herself. clicking this link will take the user to a page, showing a list of members who have posted travel itineraries for the next six months. These travelers will be divided into three groups: “my 50-50” – members who’s home base is within 50 miles of the user’s home base. “Nationwide – 50” – members, nationwide who’s travel destination is within 50 miles of any of the user’s travel destinations for the next 6 months. “worldwide – 50” - members from outside the U.S. who are scheduled to be traveling , within the next 6 months to a destination within 50 miles of the user’s scheduled destination. This page can be used, also, by just choosing a destination from a menu, without posting an upcoming itinerary going to that destination. this page, in a member’s profile, is created to help those of us with busy dating schedules. It is used as a calendar or a reminder. In this page, there will be a calendar showing the days of a member’s upcoming travel schedule. A member may highlight their scheduled meetings and travel, in order to figure out how much free time they will have available to book dates. Once dates are booked, those spaces can be filled with the date info in order to prevent confusion.